What Does Root Canal Therapy Actually Do? When your dentist tells you that you need an additional procedure to repair your tooth, you may get skeptical initially. Of course you don’t want to have to make more appointments and spend extra time in the dentist’s chair, but your dentist only advises treatment that is essential to your health. When your dentist tells you that you need root canal therapy to save a tooth, he or she means it. If you’ve never had this treatment before, you may be wondering, “What does root canal therapy actually do?” We’re getting into it on today’s blog so you can feel good about taking this essential step. It’s all right there in the name, really. Root canal therapy is a process by which your dentist accesses the root canals of your tooth — where nutrients are passed to and from your teeth to the rest of the oral tissues in your mouth. If you experience infection in your root canals, your dentist needs to remove this bacterial buildup to prevent it from spreading to other areas of your mouth and throat. Infected tooth roots can cause ear aches and all kinds of problems on top of putting your tooth itself in jeopardy. How Does Your Dentist Remove Bacteria from the Roots of Your Tooth? Your dentist accesses the roots of your tooth by creating a small hole. From this opening, your dentist can extract the harmful bacteria that threatens your tooth. To fortify your weakened tooth (the acid produced by bacteria wears away at the enamel and structure of your tooth) your dentist fills the tooth with a compound called gutta percha. 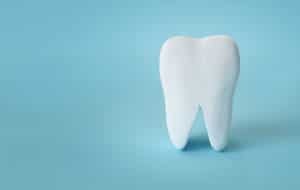 A dental crown then covers the vulnerable tooth to prevent it from suffering any more damage. Of course you don’t want to take on any additional treatment, but you may need it. Receiving root canal therapy and a dental crown now is much simpler and more cost-effective than waiting to replace the tooth later. Dr. Michael Flynn and his talented staff provide a professional care environment that makes these procedures as easy as possible. To schedule your dental appointment with Michael Flynn Dentistry, contact the office in West Allis, WI at 414-541-8250.